I don’t know about you, but I could use a break in the action. The lunar cycle of Taurus/Gemini,* which began on May 17, has been a whirlwind of mutable mishaps and marvels. Whether the experience was right up your alley or your worst nightmare, we can look forward to restoration in this next lunar cycle. This is my favorite way to approach the season of Cancer, due to start soon after the Gemini New Moon of June 16. Cancer encourages nesting. We get to digest everything we learned last month. During the last lunar cycle, multiple transits emphasized the mutable signs (Gemini-air, Sagittarius-fire, and Pisces-water. By omission, Virgo-earth was along for the ride too.) This means if you have planets in these signs, this may have been a challenging month for you. Mutable signs need to integrate information. With so much of it coming at us, giving contrary and confusing messages, I noticed anxiety levels have increased for many of us. Towards the end of the lunar cycle, Mars and the Sun came together in Gemini to light the fuses that were waiting to be lit. A Mercury retrograde period (in Gemini) also contributed to the mayhem. I am feeling unsettled as this lunar cycle comes to a close. Perhaps you are noticing this too. Much has been stirred up over the last few weeks like dandelion seeds floating on the wind. My intention of the last lunar cycle was to reconsider my certainties. Thoughts and beliefs were thrown up to land in new places. The things I thought I knew and understood well showed a different face. This is all information. The coming lunar cycle in the territory spanning Gemini and Cancer is an opportunity to finish the work of Gemini integration so we may settle into the Cancer experience of restoration and gestation. As this lunar cycle goes on, we start to calm down. Already, Saturn has retrograded out of Sagittarius back into Scorpio (fixed water) for the next three months. This is a distinct shift in focus from exterior experiences to interior ones. Remember Saturn transited Scorpio from October 2012 through December 2014. What was that like? Scorpio work is soul work. Perhaps we left some of this soul work undone at the start of 2015. Now we get another chance. Mars leaves Gemini on June 24, which will help us chill a bit more. For the next two weeks, Mercury tidies up his mess from the retrograde cycle. Some order is restored. Monday, June 15. Adaptability is a valuable skill. How easy is it for you to change course or find the right source of information for the particular problem facing you? Are you able to incite curiosity in others? Do you appreciate the diversity of life experience you encounter everyday? If so, you are a Gemini master. On this last day of the lunar cycle, reflect on how you may have learned a thing or two about these Gemini skills. A dream or meditative insight may spark the first inspirations this morning as the Moon makes aspects with Venus in Leo (fixed fire) and Neptune (mutable water). It is likely that the day ends on a upbeat with the Moon stationing itself favorably between Jupiter in Leo and Uranus in Aries (cardinal fire), sparking innovation, learning, and creativity. June 16—New Moon: Dreaming. This New Moon blows the airy promises of Gemini into the next phase of the year—the nurturing waters of Cancerian regeneration. Cancer is ruled by the Moon and thus represents the totality of cycles from seed to sprout to blossom, from blossom to fruit to seed again. We may think of the Moon as a pregnant belly gestating our dreams, giving birth to our souls. Through Cancer we attune to the cycles of life. During the height of summer (in the northern lands) Cancer is a time of gestation and regeneration. Our thoughts turn to our homes and families, whatever those things may be for each of us. We remember the homing instinct—the need for place and people to welcome us back to ourselves. Although everyone needs some kind of home, not everyone has equal access. This is also a time to develop empathy for self and others who may struggle to find a supportive home. Gemini, at its best, develops options, broadcasts possibilities, and then seeks places to come to rest. At the New Moon, we may invoke the Gemini gifts of clarity and curiosity as we seek our resting spots to gestate this season’s potential. 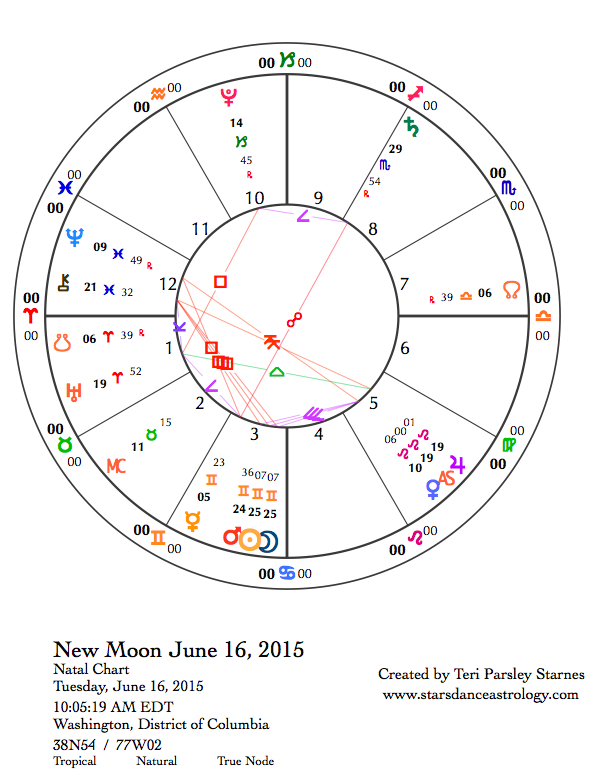 In the New Moon chart, Mars conjoins the Sun and Moon in Gemini. Blow out the cobwebs! Mars adds the force of action and reaction to our thoughts and words. The New Moon seed potential is reinforced by the seed potential of the Mars/Sun conjunction. This triple conjunction amps up the energy of this lunar cycle quite a bit, setting up a contrast between the fluctuations of mind and the resting place of home. The opportunity is to develop ways to move from one to the other with mindfulness. Gemini has the tendency to distance itself from strong emotion. Yes, it’s true. This mutable air sign can have a hard time embodying feelings. The square from Chiron in Pisces (mutable water) to the trio of Mars, Sun, and Moon presents a challenge to stay with our vulnerable feelings. This challenge holds us in good measure while we prepare to flow into Cancer, where emotions reign and emotional wisdom helps us nurture self and others. My perspective is that each sign is a season and each season is an opportunity to add another layer to our evolving selves. Every element provides an important way to create wholeness. In this season, the interplay between air and water may have us feeling uncomfortable with the differences between logic and emotion. The bright spot of this lunar cycle can be viewed at sunset all month. Beauty is a tonic and a teacher. Beautiful Venus and buoyant Jupiter are near each other in Leo (fixed fire) at the New Moon, and move closer to each other until their conjunction on July 1. These two bright planets are visible in the western sky as the Sun sets. I recommend viewing them as often as possible, inviting their beauty into your inner sanctum. In Leo, Venus and Jupiter inspire our nobility, generosity, and passion. Wednesday, June 17. The Moon’s trine to Neptune supports empathy. Perhaps you notice the homing instinct in yourself—a desire to be supported by place and people. Cancer also encourages us to support others. With more awareness of suffering through Neptune’s filters, we may even go overboard in caretaking today. Notice the ebb and flow of when you need to help others and when you need to pull back to take care of yourself. When the Moon opposes Pluto tonight (CDT) resentments may surface into power struggles. Thursday, June 18. The day might start out with anxiety or impatience that slowly transitions into the homebody feelings we are cultivating this lunar cycle. One goal is to find our place of restoration and regeneration. Perhaps the early morning agitation, courtesy of a Moon/Uranus square, is a sign that we need to make changes in our home environments. Our culture tends to encourage working harder and moving faster. We may overlook the vital necessity of resting in the pauses. Much of today offers us the opportunity to do that. The trine between the Moon and Saturn in Scorpio (fixed water) helps us recognize the benefits of support and rest. Friday, June 19. Be on the look out today and tomorrow in the western sky at sunset for the young crescent Moon to appear alongside Venus and Jupiter. [See Earth and Sky] The sight could ignite joyful expansiveness. Romance is not out of the question either. This trio in Leo (fixed fire) could also spark risk-taking, a sense of adventure, and magnetic attractions. Later this summer, Venus will retrograde through Leo, and Jupiter will finish its year-long transit of Leo. The gifts of this sign are being cultivated in each of us. May we learn to be right-sized in our egos and generous with our appreciation of others. The sextile aspect between the Moon and Mercury encourages social contact. A great set of transits for a summertime Friday night. June 20—Crescent Moon: Beginning. The airy breezes of Gemini have blown us to the shores of Summer (in the northern hemisphere). My intention for this lunar cycle is inspired by the edge between Gemini and Cancer: Opening with clear vision and curiosity to the season of gestation and regeneration. Sometimes we avoid slowing down because that is when we notice emotions beginning to bubble up. The Gemini season was a busy time of adjusting and adapting to information. We’ve been working our mental muscles. With this lunar cycle, we learn how to integrate that experience with the Cancer instincts to nurture and restore through emotion. This phase of the Moon helps us shift gears. Tomorrow’s Cancer Ingress (Summer Solstice in the north) will continue that process. 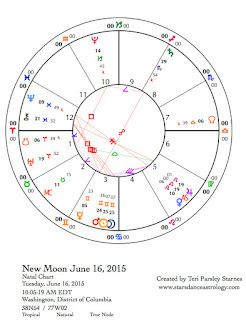 We may be feeling bold with the Moon in Leo (fixed fire) conjoining Venus and then Jupiter, also in Leo. At sunset, the Moon is right in line with these bright lights. [See Earth and Sky] The best that Leo has to offer is beckoning right now. This noble sign gives light to our essential selves, and this beauty empowers our intentions for the lunar cycle. The trine between the Moon and Uranus bolsters a commitment to change. Sunday, June 21. Cancer Ingress also known as the Summer Solstice in the Northern Hemisphere. Every human has a “homing” instinct. Wikipedia defines homing as: “the inherent ability of an animal to navigate towards an original location through unfamiliar areas.” The sign of Cancer, the fourth house in our natal charts, and the Moon (ruler of Cancer) offer us signposts leading us back to our original locations. If we have strayed too far or lost touch with this originating place, our souls say: Come back, come back. Summer is the season of hearing that call. Notably, this day of crossing over into Cancer is influenced by Leo, where the Moon, Venus and Jupiter broadcast the beam of essential self. Leo emphasis says we need to find out if we really matter, we need to share and express our gifts. Awareness of our essential selves is an important part of the return to home that we experience this season. The Sun in Cancer (cardinal water) is quincunx to Saturn in Scorpio (fixed water). The journey inward is important yet difficult. Be patient with your obstacles. The quincunx between Venus and Pluto tells us to work on self-esteem. Self-love is the beginning of love. Most of us have inherited toxic notions about loving ourselves. Mercury in Gemini (mutable air) will square Neptune in Pisces (mutable water) in a few days. We feel this strangeness blurring the boundaries. What are you forgetting? The remembering may lead you back home. *I am focusing on intentions inspired by the cusps between signs for each New Moon this year because the lunar cycles begin near the end of a sign until the end of the year. Read about the beginning of the Taurus/Gemini lunar cycle on my website.